Just like your car, it’s important to always keep your boat properly maintained, as even minor neglect can turn into a significant problem if not remedied quickly. Here are 5 vital maintenance activities you should be performing on your boat if you want it to be ready to set sail in the near future. Boats are funny creatures. Unlike many other vehicles or tools, some corrosion is typical and you need to learn to differentiate between visual signs of concern and normal wear and exposure. Frayed rope, on the other hand, is often much more of a problem than corrosion. Always check your ropes and replace damaged lines as noted. 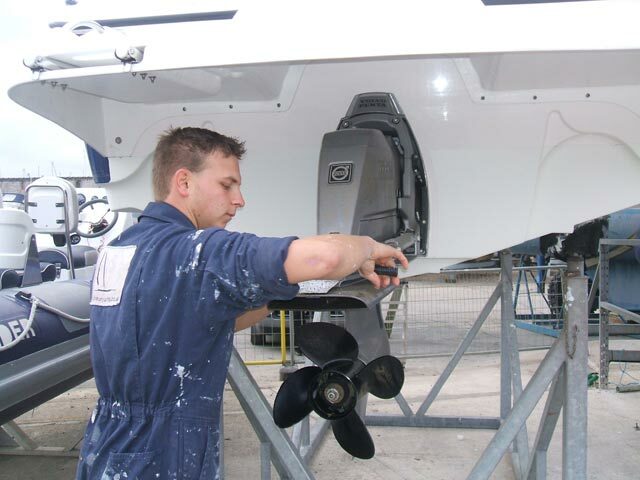 You can also reduce the likelihood of element-based wear by always keeping your boat covered. Excessive sun exposure can be a contributing factor to damaged rope, so cover your boat well when not in use. Just like a car, boats need to have their oil changed regularly. Though specifications may vary, standard interval for oil changes is every 100 hours of boat operation. Ideally you should change your oil while your boat is in the water, as it naturally keeps the engine cool. It’s also important to use “marine grade” oil in your boat – using the wrong kind of oil, such as what you would put in your car, won’t protect the heavier machinery of the boat motor. One maintenance task that should be performed every time you use your boat is a complete motor flush. During this check you should also monitor your engine’s cooling system and other internal fluid levels. While checking these motor features, be sure to note any physical changes like rust or damage that could prove to be a problem down the line. If your boat has mechanical steering, you’ll know it’s time to change your steering cable when you notice excessive friction or movement during steering. There are a couple of steps to changing your steering cable, but overall it isn’t an excessively difficult task. The most important thing when changing your steering cable is that you replace your cable with the same type as was originally found in your system. Mixing cable types can cause significant steering problems. If you can’t identify the cable by sight, consult your owner’s manual. To prevent damaging your boat, you’ll need to store it properly when it isn’t in the water. Start by removing any plugs and disconnecting the battery. In colder climates, you should remove the battery altogether in order to store it somewhere where it won’t be at risk of freezing. Disconnecting your battery will also reduce the likelihood of power loss during the period it isn’t in use, but you should still check your battery’s charge level before reinstalling it. A well-cared for boat is a thing of beauty, but maintaining it properly takes time and skill. Commit to your boat and you’ll enjoy the beauty of boating with friends and family for years to come.